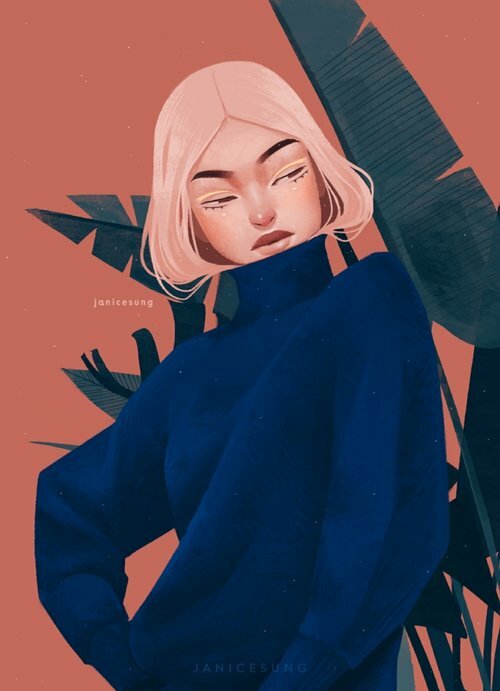 I’m so excited to start off 2019 with a spotlight on the incredibly talented Janice Sung! The young Toronto native expresses her love for foliage, fashion, and beauty through her stunning artwork. Often featuring female subjects, her illustrations exude, for lack of a better word, coolness. Yes, I realize that might sound silly but when I first saw an illustration of hers I felt the subject of the illustration looked familiar. That’s because the females in her illustrations possess the confidence of that cool girl we all follow on Instagram(we all follow at least one cool girl…dont pretend you don’t know what that is). You know the girl, the girls whose highlighter is out of this world and you wonder how she fills in those brows perfectly every time! Keep scrolling to learn more about Janice Sung and her gorgeous muses. My favorite activity as a child were coloring books and I actually grew up watching my dad draw. He just did it as a hobby but I was amazed with how he was able to capture the essence of an object on paper. I am! It was never a question for me. Painting/drawing was what I was good at and I had no doubt that this is what I was meant to do since the age of 7. I knew I wanted to do something in the arts, at first it was fine art, and then animation, and now illustration! I find inspiration from everything that’s just aesthetically pleasing to me. I love looking at fashion and branding photography, plants and even furniture. As for who, I would say Audrey Kawasaki made the biggest impact on me throughout my artistic journey. When I first saw her work I instantly became obsessed, there’s something so soft, beautiful and seductive in every one of her pieces. It depends on what I’m inspired by. Everyday I’m looking on Instagram and Pinterest for inspiration, when something catches my eye I’ll make sure to save it so I can look back on it when I’m ready to start a new piece. I’ll make sure to collect inspiration from many different sources/photos before I start, and I’ll just go from there! If i’m inspired by a color scheme, then i’ll start my painting by blocking in colors first, if it’s a pose, then I’ll start by exploring similar poses. So it definitely ranges for every piece. I don’t even know where to start. It’s evolved so much that I’m no longer attached to the word “style”, I’ve accepted that it’s an ongoing journey and I’m much more focused on growing and improving as an artist than being focused on what certain style I have. When you let yourself get too attached to a certain style you lose your creativity and the drive to explore and experiment. Being self employed no matter the occupation is always a challenge. Luckily, I absolutely love what I do and I also love running my own business, I like planning, and constantly pushing myself to work harder everyday. Obviously money can sometimes be an obstacle since freelancing means there’s not guarantee of a steady income but I really think being able to be your own boss makes it all worth it. Whenever I feel uninspired I’ll just take a break from painting. I don’t believe anyone should ever force themselves to be creative when they don’t feel like it. When you force yourself to be creative you’ll slowly take away the love and passion you have for your craft. When I feel uninspired I’ll do the following: - take a break - save a bunch of pretty photos so I can look back at it when I feel like working again - try doing different activities that relax the mind, like yoga.